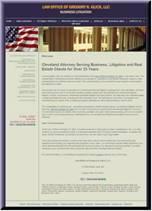 Our lawyers provide litigation, transactional and banking legal services to clients looking for counselors with the skills, expertise and reputation to offer a sophisticated alternative to Ohio's largest law firms. Our firm excels in providing cost effective solutions to client's problems. We value our reputation for having a plain-speaking, above-board approach that will help you make decisions that resolve your particular legal need in a manner that is expeditious and confidential. We can easily be reached by telephone, fax, and e-mail, so that we can quickly respond to your inquiries at all times. We do everything necessary to keep you informed and knowledgeable about your particular legal situation. That means that we stress personal attention, responsiveness, and accessibility: We listen to you. We return your phone calls promptly. We will regularly report to you on the status and progress of your case.